This whole entry came from Pink Tentacle - a fantastic blog that pics up all sorts of goodies from Asia. 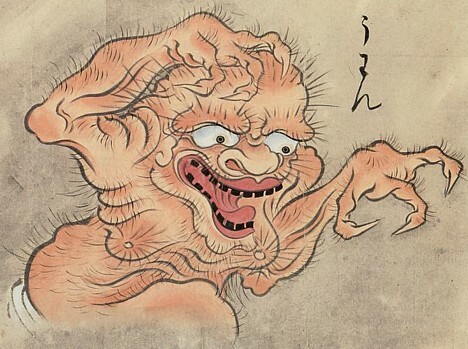 "In the sophisticated popular culture of the Edo period (1603-1868), much attention was devoted to Japan’s rich pantheon of traditional monsters and apparitions, known as youkai. 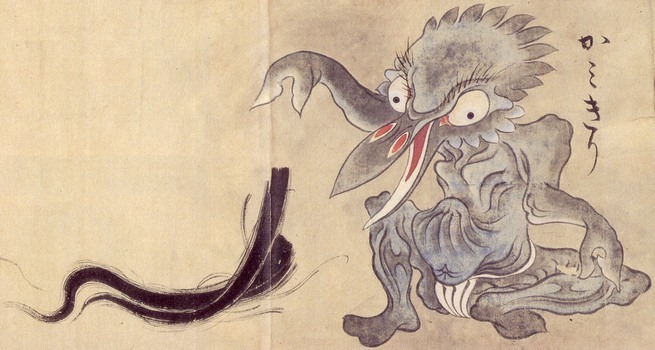 Sometimes frightening, sometimes humorous, these compelling Japanese folk creatures were the subject of numerous artistic and literary works. One such work was Hyakkai Zukkan, a collection of picture scrolls completed in 1737 by Sawaki Suushi, a relatively unknown artist who studied under master painter Hanabusa Itchou (1702-1772). Hyakkai Zukkan’s colorful depictions of Japan’s most notorious creatures inspired (and were copied by) youkai artists for generations. Here is a peek inside. Ushi-oni is usually seen in connection with a related monster, called Nure-onna. 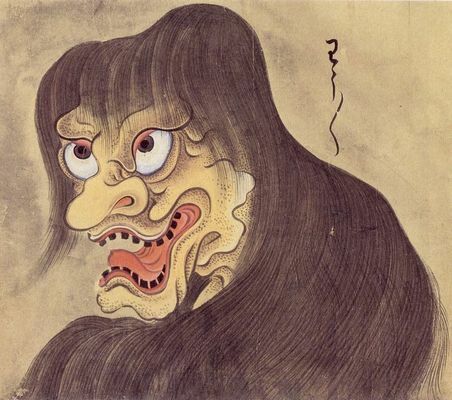 In ancient Aomori prefecture legends, Uwan is a disembodied voice that inhabits old, abandoned temples and homes. When a person enters a haunted building, the formless spirit belts out an ear-piercing “Uwan!” (hence the name). The voice is only audible to people inside the building — those standing outside hear nothing. Uwan consists only of sound and poses no physical danger. 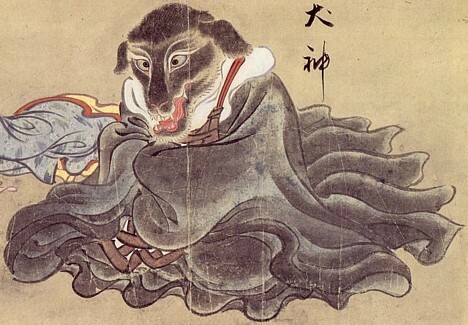 Ancient Japanese legends are rife with examples of formless youkai like Uwan, which consist of nothing but sound, light or other natural phenomena. 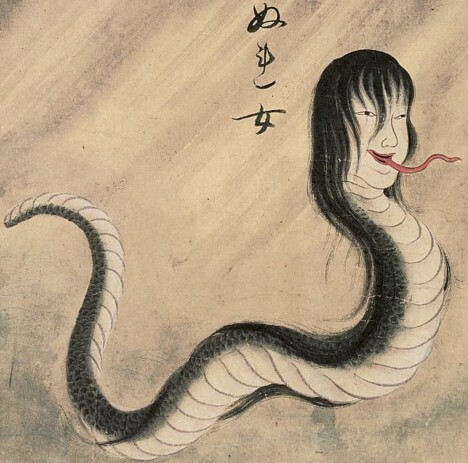 In the Edo period, however, these youkai assumed physical bodies as artists incorporated them into their work. 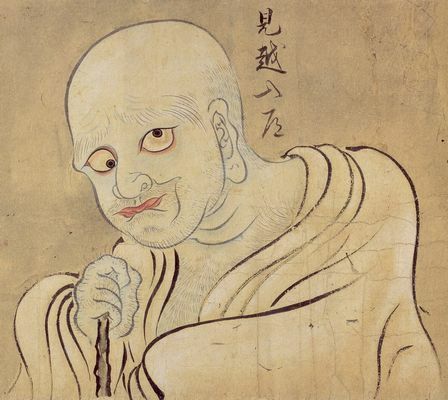 Another youkai that got a facelift in the Edo period is Nurarihyon, pictured here as as a well-dressed old man with an elongated bald head. Ancient Okayama prefecture legends describe Nurarihyon (lit. “slippery strange”) as a marine creature found in the Seto Inland Sea, often seen bobbing around on the surface of the water like some sort of giant jellyfish or octopus. Nurarihyon eludes capture by diving underwater when people approach to investigate. In the Edo period, Nurarihyon came to be known as a mysterious old man with the uncanny ability to sneak into homes and “take over.” When the residents of a home encounter him sitting around drinking tea, they are unable throw him out and cannot help but treat him as the head of the household. Nurarihyon is said to be a highly respected figure in the world of youkai. 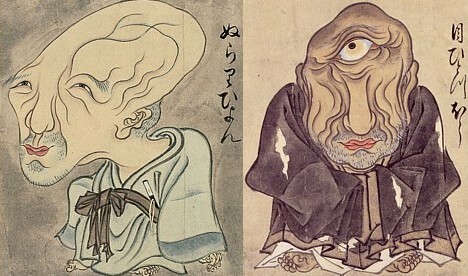 Mehitotsubou (above right), a large monk with a cyclopean eye, is a variant of the large shape-shifting monks commonly found in Japanese folk tales. Another monster monk is Mikoshi-nyuudou (a.k.a. 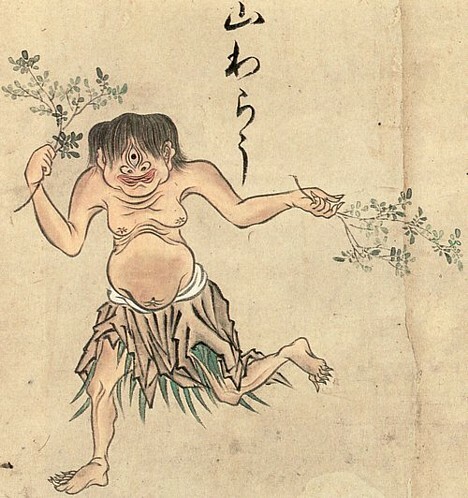 Miage-nyuudou), a large, cross-eyed mendicant encountered on mountain passes or on lonely roads at night. Mikoshi-nyuudou grows taller when you look up at him — and the higher you look, the taller he grows. Look up for too long and you will die, goes the legend, but say “mikoshita” (”I see higher”) and he disappears. Mikoshi-nyuudou’s true identity is unknown, but in some areas he is believed to be a shape-shifting weasel, fox or tanuki. Yama-warau (a.k.a. Yama-waro) are hairy, one-eyed Garappa (a variety of Kappa found in Kumamoto prefecture) who have gone into the mountains for the winter. These child-sized creatures are known to provide assistance to lumberjacks in the mountains, and they eagerly return again and again to help, as long as they are rewarded with liquor and rice balls. Like other varieties of Kappa, Yama-warau are fond of playing tricks on people, and they enjoy sumo wrestling. They sometimes break into people’s homes to take a bath, and they have a sixth sense for danger, which allows them to escape from people with evil intentions. At the spring equinox, Yama-warau return to the rivers to live as Garappa. They travel in groups, jumping from one rooftop to the next, all the way down to the water. If, along the way, they come across a new home under construction, they get angry and poke holes in the walls. Legend has it that anyone who goes to the river to catch a glimpse of a returning Yama-warau will become sick. Ouni is a mountain hag with a mouth stretching from ear to ear and a thick coat of long, black hair covering her entire body. According to an old Niigata prefecture legend, Ouni appeared one day to a group of women as they were spinning hemp into yarn. After accepting the hairy hag’s offer to help, the women watched in surprise as she repeatedly placed raw hemp fiber into her mouth and pulled out finished yarn. After quickly producing a large quantity in this way, Ouni stepped outside and suddenly disappeared. Legend has it that she left footprints in the nearby rocks, which can still be seen to this day. For more images from Hyakkai Zukkan, see the Sawaki Suushi collection at Wikipedia Commons."